Samsung unvieled three new devices for the Indian market at a recent event. All three devices are of different platforms and share the same form factor. You may say that, Samsung launched a device for each of the platform(OS) it is currently working on. 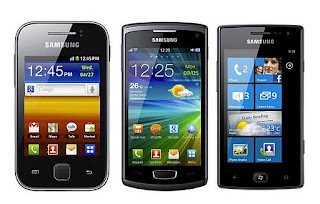 The Samsung Galaxy Y will be available in stores from this week itself, and Samsung Wave 3 and the Samsung Omnia W will see in stores from the month of November. Rapfox Video Player is free & high performance, supports rmvb, mkv, avi... videos. You can play high definition videos in Android phone directly. 1. It supports rm, rmvb, mkv, avi, mp4, mov, 3gp, etc. Because it is based on FFMpeg, it supports lots of file formats and codes. 3. It is optimized for Android's ARMv6, ARMv7 and dual-core CPUs. It can download the suitable codec plugin according to your phone CPU. 4. Its decode and display speed is fastest.